There are many reasons to love chambray, but the two that top my list are versatility and seasonlessness. I know that's not a real world. A good chambray shirt can be dressed up or down and worn through all four seasons. For a date to night date night look I paired this chambray shirt with a fitted polka dot skirt I picked up on sale at Maje a couple of years ago, burgundy suede heels, and a sparkly statement necklace. How is it Thursday already and I didn't think I was going to like Taylor Swift's transition into pop as much as I do. Thoughts? This has got to be my favorite look on you!! I LOVE the idea of dressing up chambray! That skirt is perfect and so are your Gucci heels! Gorgeous!! 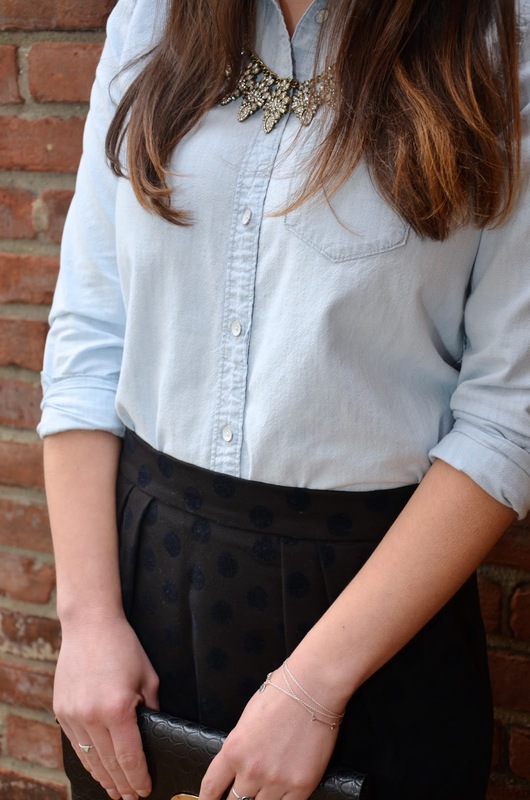 I love how you dressed up that chambray top! That skirt is amazing and I love those heels! I am loving the blue tones with the wine! Very cute look. That skirt, the double layer and polka dot high-low texture is so pretty. You look adorable. I'm obsessed with this skirt! I love the subtle pattern and layering!! and I am TOTALLY digging Tswizzles newest album, and I'm not sorry! Love the skirt! And yes, I've been playing Taylor's new album on repeat nonstop!